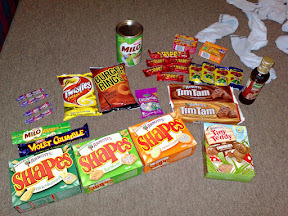 Today is Australia Day, and to celebrate I bought a whole bunch of yummy Aussie goodies from the Australia Shop in Covent Garden to show my workmates! 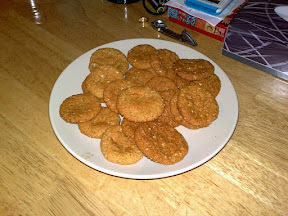 I also baked some Anzac bikkies to keep in the spirit! Everything seems to have gone down well because there’s nothing left but crumbs! But I’m holding out the piece de resistance… Tim Tams!! Anzac Biscuits made by ME! Brilliant. You’ve got to love the pizza shapes! Haha you bet! Spent WAAAY too much at the Aussie shop in Covent Garden, but it was worth it! « New office and olde British fayre!